" TAILWIND " ~ Elvgren(TM) SUPER SALE! BOMBER GIRL PIN-UPS and MY UNCLE BENNY and WWII MISSIONS. 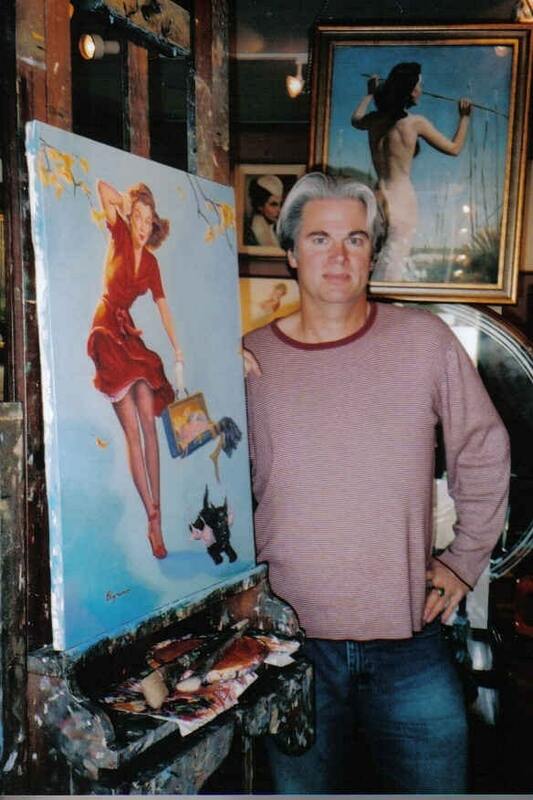 Here is one of my favorite and best pin-up paintings that I made in the last 25 years. It is a replica painting. This was first painted (though unfortunately the original was thrown away in 1960) by Elvgren about 1939 or 1940 the original was used for calendar art, cards advertising and for lady box top art for fine seamed stockings for many years. 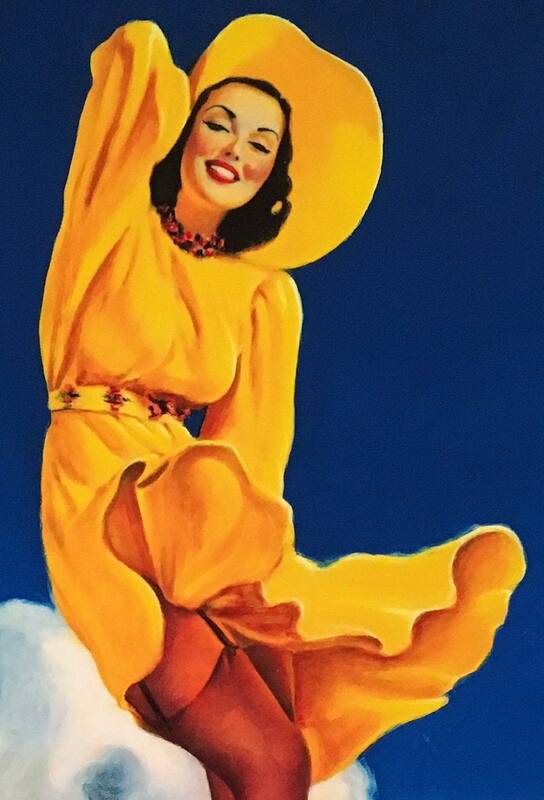 It was no accident that this painting was made to look like Rosalind Russell, popular movie actress of the time. ("My Favorite Secretary" with Cary Grant). 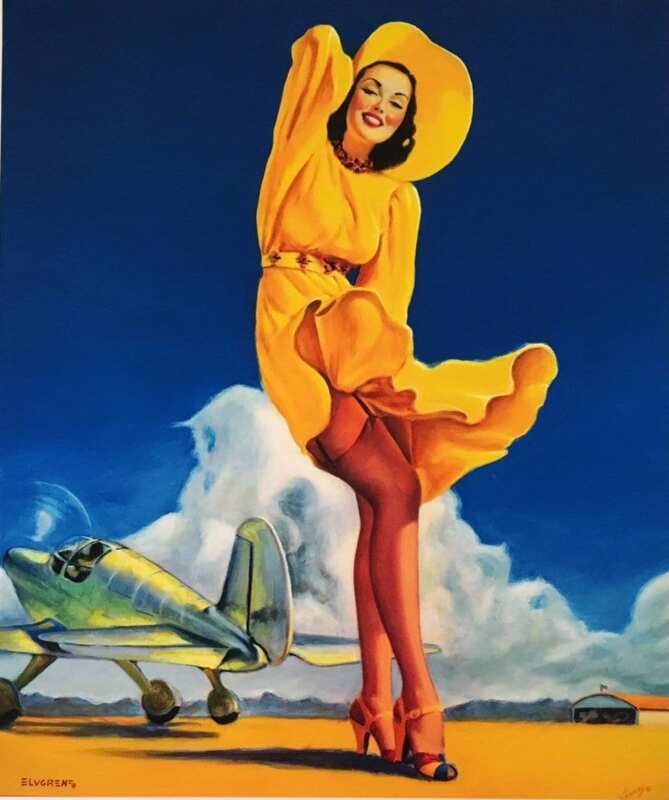 During WWII, this pin-up was a popular image for the flight crews in the Army Air Corps to copy and paint on the sides of Bombers like B-17, B-24, B-29, and their crew jackets. One such was my own uncle Benny, a tail gunner in a B-17, shot down over Europe. After surviving 34 missions, the entire crew of 10, evaded capture by the Nazi SS. After a belly landing in the snow on a mountain top. They were rescued, hidden then transported across France by the French Resistance, who if caught would be tortured, then shot on the spot. The crew, some injured, were then ferried safely back to England at night on a fishing boat! All were treated, given R&R and sent back home. It was highly unusual for an entire crew to survive a mission tour over Europe when most single missions had 10 to as much as 30 percent loss rates per each mission flown. These pin-up mascots were reminders of the girls waiting for them to get home. 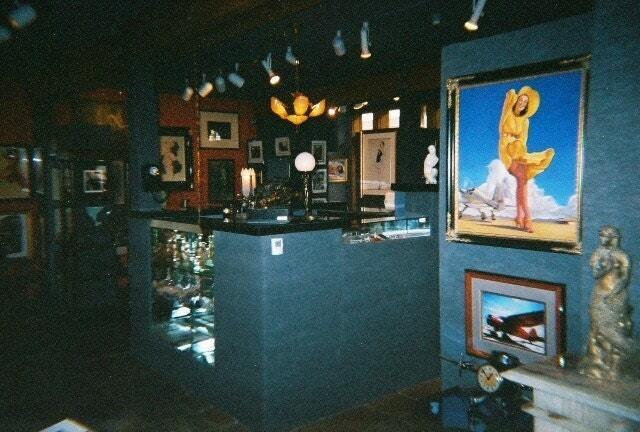 The original painting of Tail Wind was stored in a huge art archive of about 10,000 calendar art and pinup paintings used by DOW advertising company, who closed in 1960, sold their property and had to remove the 60's years of stored art. At the time no one wanted these fine originals, so they cleared the entire lots and it was taken to the dump. In a similar way, B&B had several storage clean outs of their pin-up and calendar art paintings, one such was in 1957. Very few paintings of this early DOW Elvgren era survive today. 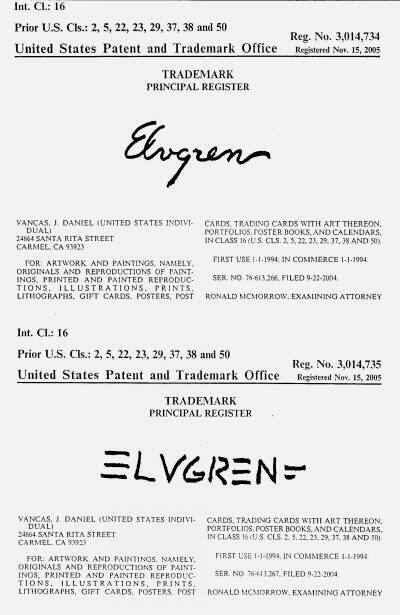 It is estimated that about 40% of all Elvgren pin-ups were thrown away, by Dow, by Brown & Bigelow (B&B) and several other advertisers. These events were personally told and confirmed to me by the former employees and even former owners of these companies who were there at the time. 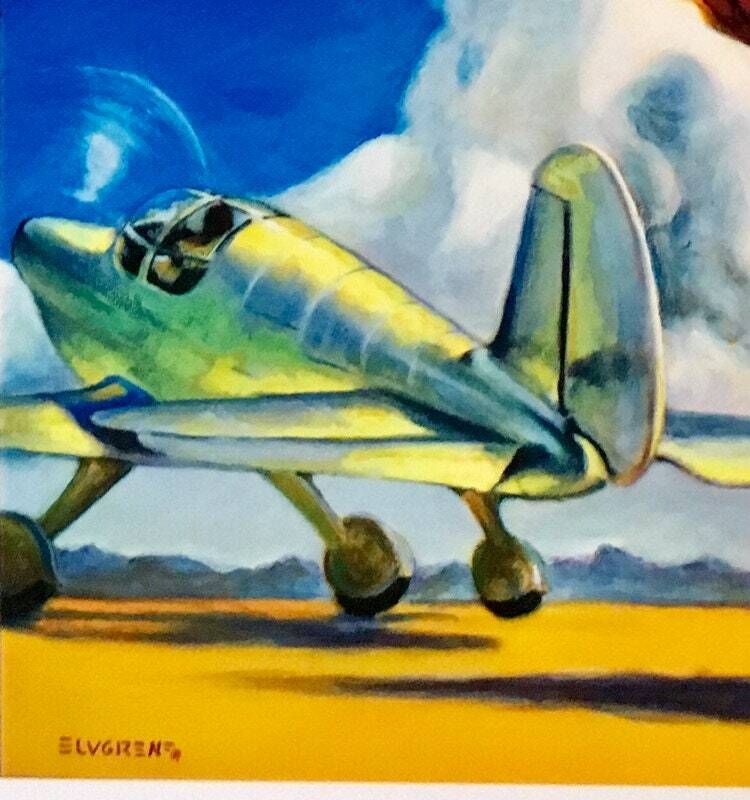 TAILWIND, This painting was made by me, painted on the original Elvgren easel where he created the first one. This is the only fully authorized preservation of it. My new painting of Tail Wind is now the replacement art archive for this and many other lost Elvgren pin-ups that I have painted since 1995 and preserves the art for another generation to enjoy. I have been doing this legally and properly, with protection, backed by Permanent Federal Court Orders, signed by B&B, for over 22 years. I also paint original works of art and pin-ups called " Vancas Girls". My revival and restoration pin-up work is often imitated, but the quality and the heart and soul is never duplicated. Please collect only the best-painted recreations, originals, and limited edition art prints by "Daniel Vancas". To know you are receiving the best, look for the original Vancas signature, and stamp on the reverse of each and every one. Tail Wind is a new derivative copyright by Daniel Vancas (c) 2008 and 1994 all rights reserved. I have over 25 years of work and 1 million invested in IP, promoting pinup revival, then developing and recreating Elvgren pin-ups. Please respect my hard work and investments by only collecting my authorized art and not pirated and unauthorized copies from other sites. ~ WHO WOULD LOVE THIS ART: Vintage Lady Renee Stockings, collectors, vintage Calander Illustration Art.